Although it is a French island, Guadeloupes people, personality and culture are the result of a harmonious blending of European, African and East Indian origins. Islanders, many of whom are attractive examples of mixed origins, seem delightfully colorblind when it comes to skin color. They say that, in Guadeloupe, what counts is what's in your heart, not the color of your skin. In its official status, the Départment of Guadeloupe is an archipelago of French possessions. This archipelago includes the islands of St. Barthélemy, St. Martin, Les Saintes, La Désirade, Marie-Galante and Guadeloupe itself. In practice however, the name Guadeloupe simply refers to the butterfly-shaped island. As a French dependency, Guadeloupe enjoys modern roads, excellent schools and a high standard of living. Guadeloupe is actually made up of two islands connected by a bridge over the Rivière Salée. 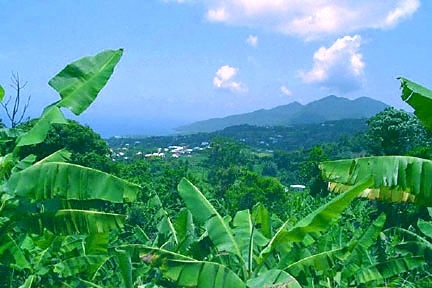 To the east lies Grande-Terre, known for its white sand beaches, rolling hills, cane fields and resort areas. The islands economic capital, Pointe-à-Pitre, is located on Grand-Terre. To the west lies Basse-Terre, the larger of the two islands. Basse-Terre has a very different topography with its renowned rain forest, waterfalls, mountains and world-class diving. The capital of Guadeloupe, on this western-wing, also bears the name Basse-Terre. On both halves of the butterfly, friendly West Indian hospitality and delicious cuisine enhance the natural wonders of Guadeloupe. The island is located 3075 km (1845 mi) from New York, 7267 km (4360 mi) from Paris, 3563 km (2138 mi) from Montreal, 502 km (310 mi) from San Juan and 208 km (125 mi) from St. Barth. The western wing, Basse-Terre, is 811 sq. km (312 sq. mi) and the eastern wing, Grande-Terre, is 567 sq. km (218 sq. mi). The population of Guadeloupe proper is approximately 410,000. The figure for all of Guadeloupe, including the offshore islands, French St. Martin and St. Barth is approximately 450,000. Guadeloupe operates on Atlantic Standard Time (Eastern Standard Time plus 1 hour or Greenwich Mean Time minus 4 hours). The island does not convert to daylight savings time. Local time is usually indicated the 24-hour format (1:15 p.m. is 13:15 or 13h15).